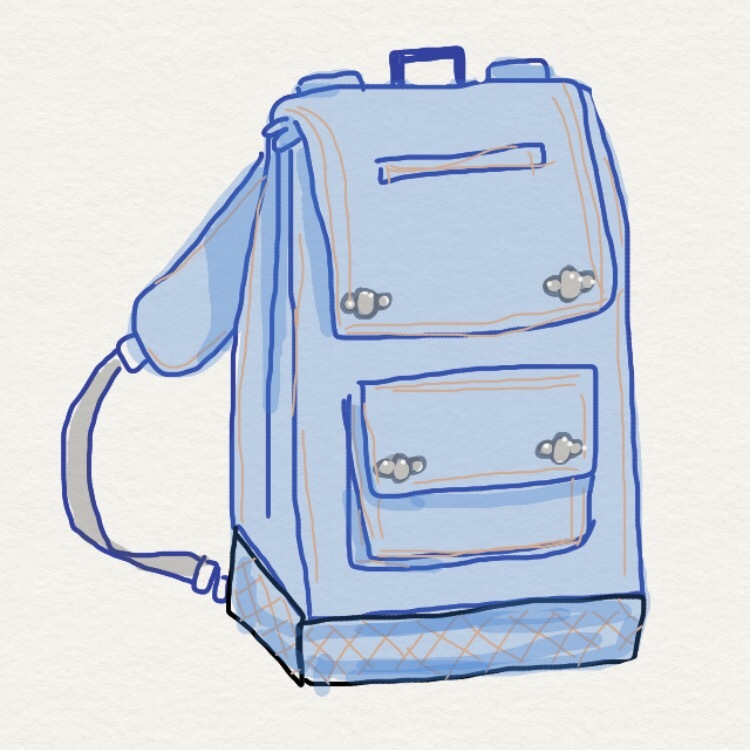 Usually when I’m making a bag, I’ll start by obsessing about it all evening… First I’ll sketch it, then think what size it should be. Draw it again, maybe on the iPad, and colour it in. Then I’ll draw each ‘face’ and if it has pockets, flaps, zips, studs etc. I’ll think about what order it’ll go together in, if it’ll be lined or will I bind the edges…? … Then I really have to focus to work out exactly how many pieces are needed (usually a lot, and I usually forget a few pocket linings or something and have to cut them out of scraps!). In the morning I always think it’s going to be a quicker make than it is and it’ll take me all day… it’ll be 9pm and I’ll be hungry and un-washed and exhausted … but I’ll have a bag! Bags can get thick at the seams very quickly, especially when quilting too. Nine or more layers. So choose your fabric wisely and make sure your needle and machine are up to it. Make a pattern or write your formula down clearly. The last thing you want to do when it comes to replicating your success is have to start from square 1 again. How many pieces? Check and double check that you have calculated all the pieces you need, lining, pocket linings, tabs, zip flaps, welts, wadding… they can really add up! Haberdashery. 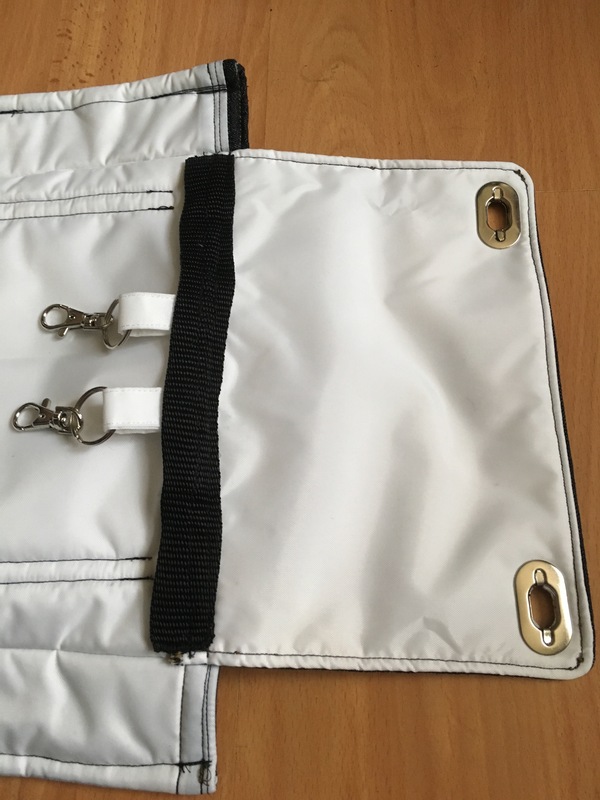 Sketch your finished bag and have a look at some existing ones to work out the straps and what fixtures & closures you need: d-rings, lobster-claws, key-holder, zips, webbing, magnets…? To make the pattern, look at the sketch you have done and decide where the seams will be. Will it be lined? Bagged out or underlined? How will you finish any exposed seams… serging, binding…? All these things will be important when you plan the order of construction. I’m my (limited) experience this is similar for most bags, but different with every bag! So depending on your preference, design, seam finish etc the construction order can vary widely. Think it through thoroughly before you start. Assemble the outer and lining, separately if bagging out – together if underlining. Attach or create the base incorporating tabs or straps. Join at the opening and turn through the base of the lining (if bagging out) or sew together and bind or serge the raw edges. 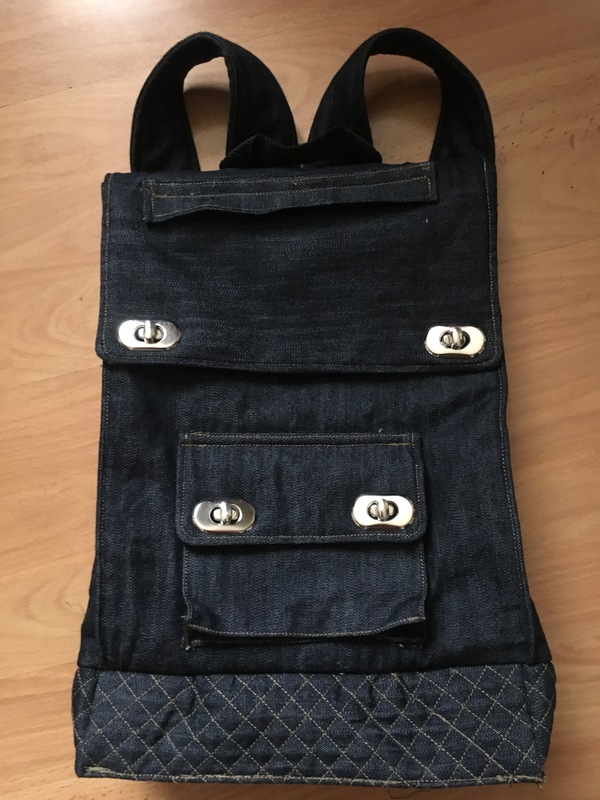 This is how I took this bag from idea to reality. I’ve been collecting bag supplies for a while now and have assembled quite a selection. I’ve decided to use quite a few of them on this bag. Some might say too many. But I wanted to give it a go anyway! 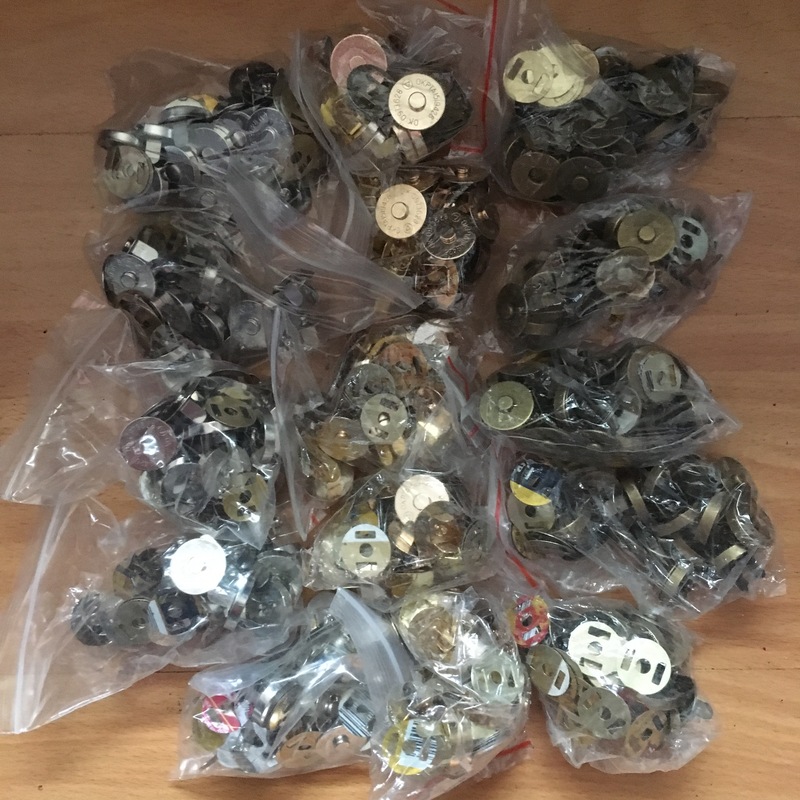 Don’t think you have to have a big cache of hardware to make a bag though, most of these closures and fixtures could be replaced with buttons and d-rings. 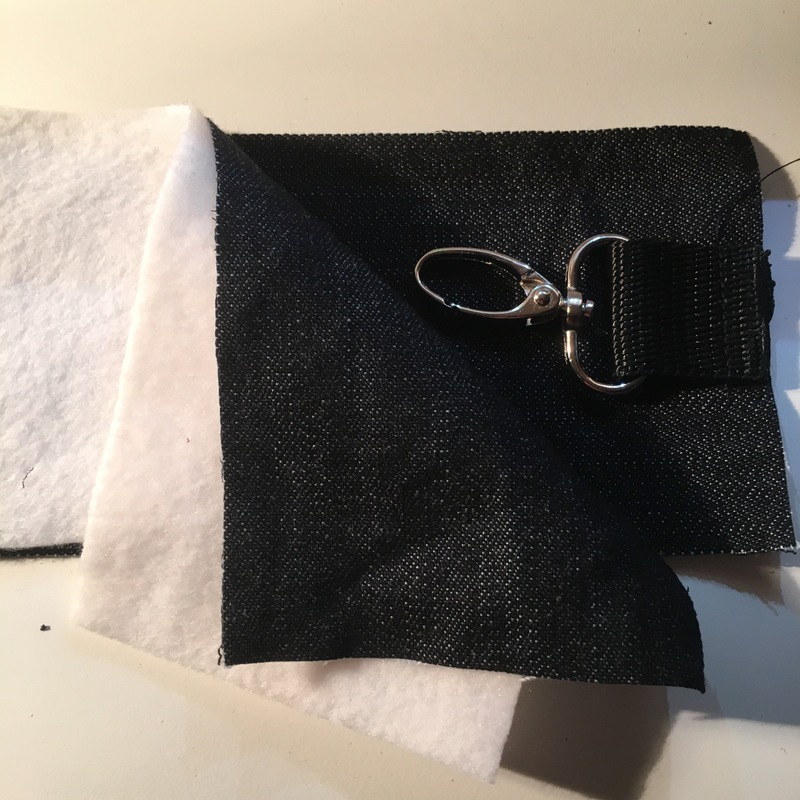 Apply fusible interfacing to areas where zips/ magnets/ closures will be. Quilt the base and cut to size. Mark 6.5cm in from each corner and draw a box. Fold the corners to shape the base, stitch the triangle and baste down to the long side. Pin short strips of webbing with squared d-rings to the outside back of the base and baste in place. Cut a letterbox opening at the zip mark. Fraycheck and press to the inside. Position the zip behind and edgestitch in place. 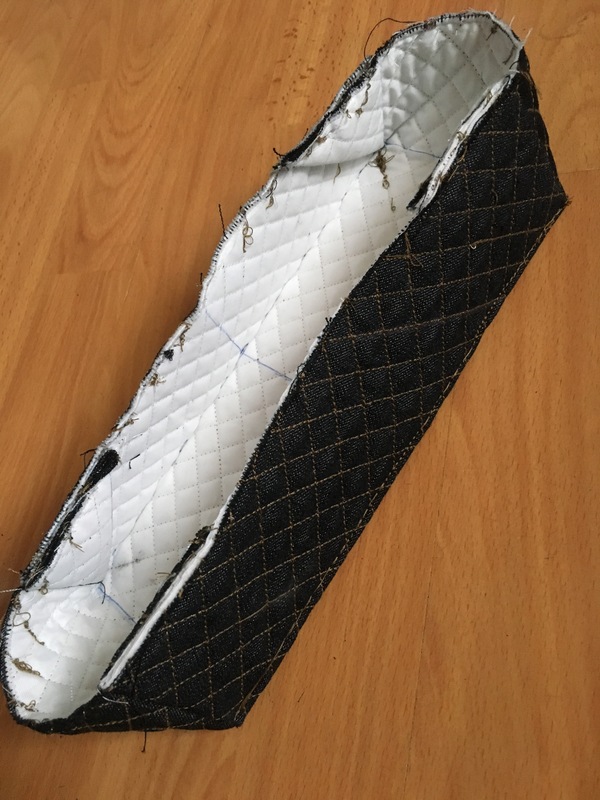 Prepare the Zip Flap Cover by sewing the 3 sides, clipping and turning, topstitching and zigzagging the raw edge. Then fold it down over the zip and sew at 1cm to hide the raw edge. Sew the short sides down also. 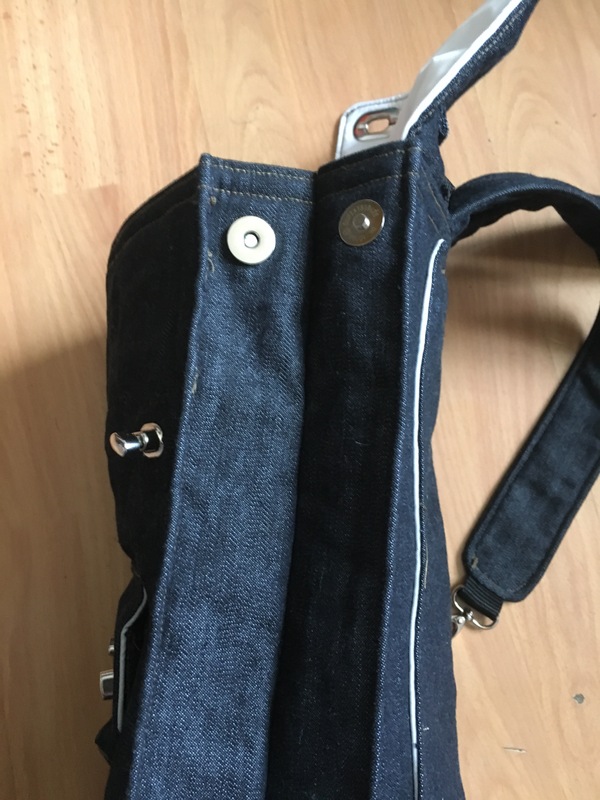 On the inside, sew a pocket bag piece to each side of the zipper. Lay the lining pieces together, trim, pin and sew. Assemble the Top Flap, lay the outer piece face up. Lining piece face down on top of it. Wadding on top of that. Sew around the three sides, clip, turn, topstitch. Mark and cut the holes for the Twist openings, fraycheck and attach the ‘holes’. 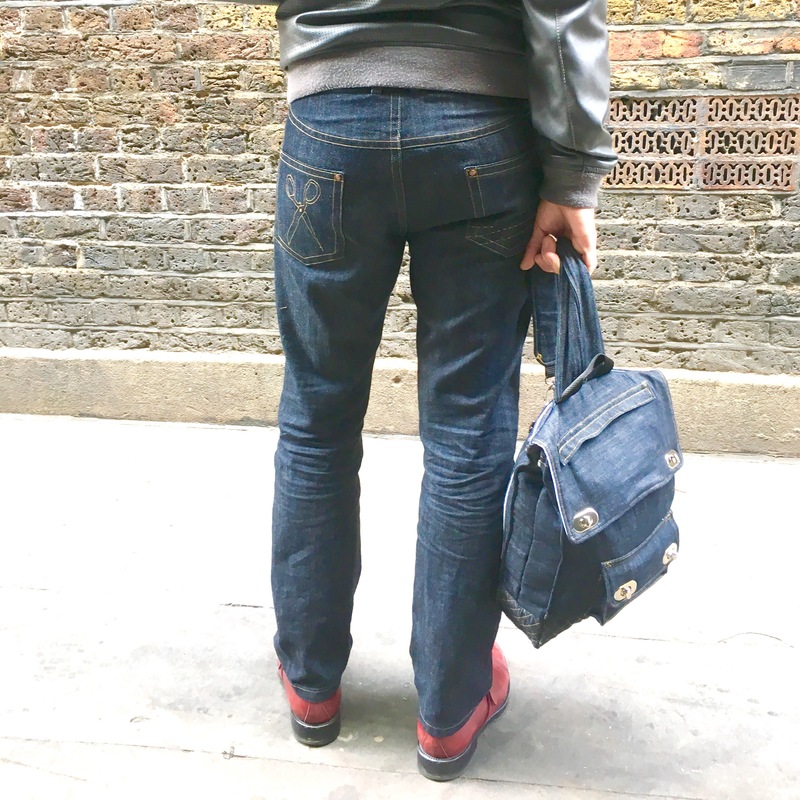 Assemble the Front Pocket Flap in much the same way as the Top Flap, including the ‘holes’ of the Twist Closure. 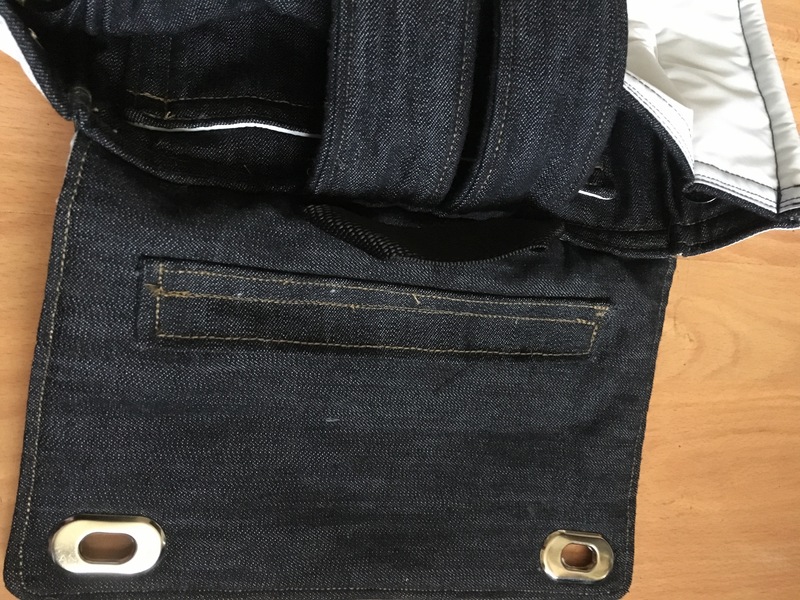 Assemble the 3 layers of the Front Pocket. Stitch the top seam, turn, press and topstitch. Zigzag the raw edges. Fold and press the sides of the pocket so that it fits under the flap. Edgestitch the crease. Fold the bottom up to match the sides and edgestitch in place. Box the corners by pinching out the triangles and sewing down. Trim off the excess with pinking shears. Carefully fold and press the concertina shape into the pocket and press the zigzagged edge to the underside. Use plenty of steam! Position the Front Pocket on the Front and stitch down the three sides. Reposition the fabric as you change sides. Sew the Front Pocket Flap down in the same way as the Top Flap Zip Cover. Mark the position for the Twist Closure on the Front Pocket and attach in place. Mark a vertical line 6.5cm in from each side, fold and press with the right side facing out. Edgestitch the crease in place. Layer and sew up three sides. Clip and turn. Press and topstitch the top. Zigzag the raw edge at the bottom. Sew face down to the Back Piece, 3cm up from the bottom edge. Press the Pouch up onto the Back and edgestitch in place. Edgestitch creases into the Back piece same as the Front. Lay one main fabric Strap piece face up. Position a 5cm piece of webbing with a Lobster Clip at one short end. Lay another main fabric piece face down on top and the wadding/fleece on top of that. Pin & stitch down one long end, curving over the webbing end and up the other long side. Fold and position a strip of webbing to the raw edge of the Top Flap as a carry handle. Baste in place. Baste the raw ends of the straps (right side down) on top of the carry handle. Baste 2 lining tabs with Lobster Clips to the inside of the Back. Position the raw edge of the flap inside the top of the Back piece. Use a strip of webbing on the inside to cover the raw seams at the join. Lay the front on the back and mark positions for Magnet Snaps. Reach inside and attach them to the main fabric only. French seam the front to the back by first sewing together at the side seams with right sides facing outwards. Sew at 5mm. Trim, turn and press. Sew again from the lining side at 1cm to conceal the raw edges. Mark the position for the Twist Closures on the Front piece. Reach up inside to attach them to the main fabric only. With the base right side round and the main bag inside out, pin the base inside the bottom of the bag, matching the corners. Sew the base on and finish the seam with bias binding or zigzag stitch. As the bag got thicker, my modern machine started to feel the strain a bit and was skipping stitches. I had to switch to my vintage machine to finish some of the bulkier seams which has left it a bit scrappy in places. That’s the price I pay for choosing denim as my main fabric and fleece to pad it out! Think carefully about your fabrics and how much your machine can handle before you start out. Once I’d worked out how to finish the straps (I am perhaps a little guilty of over-designing the ‘strap furniture’!) 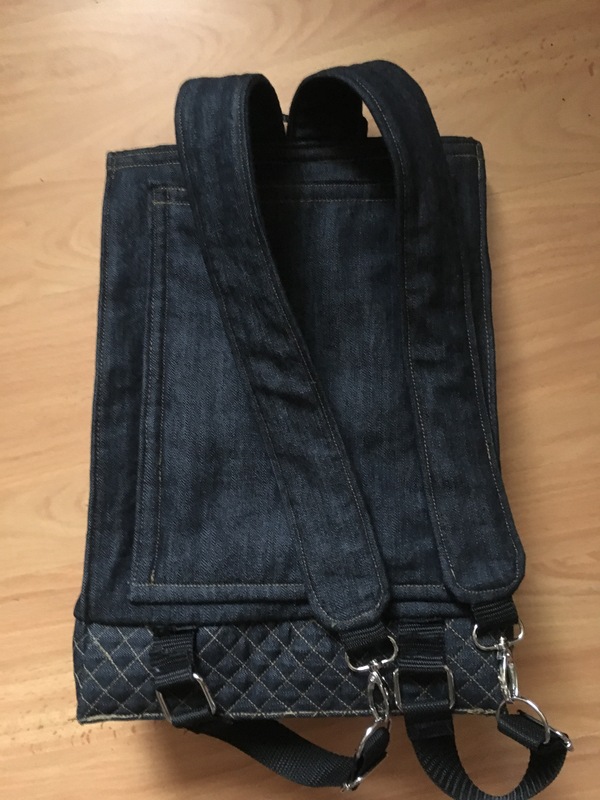 I’m really happy with the finished bag! 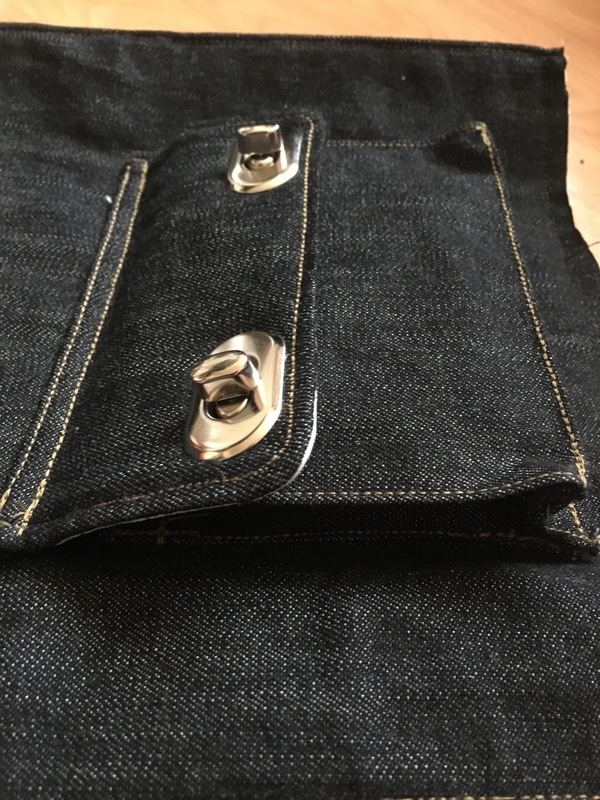 It’s my first concertina pocket… I love it and I think the silver closures raise it up a bit, although it would look great in a more relaxed style with jeans buttons and exposed metal zip. The whole bag feels really sturdy. It’s lined in white nylon so it’s really easy to scrabble about inside and find what you’re looking for. You could add inside patch pockets, but I think the outside pockets are enough. I don’t know about you, but it seems to me that the more pockets I have, the more pockets I have to go through before I find what I’m looking for! 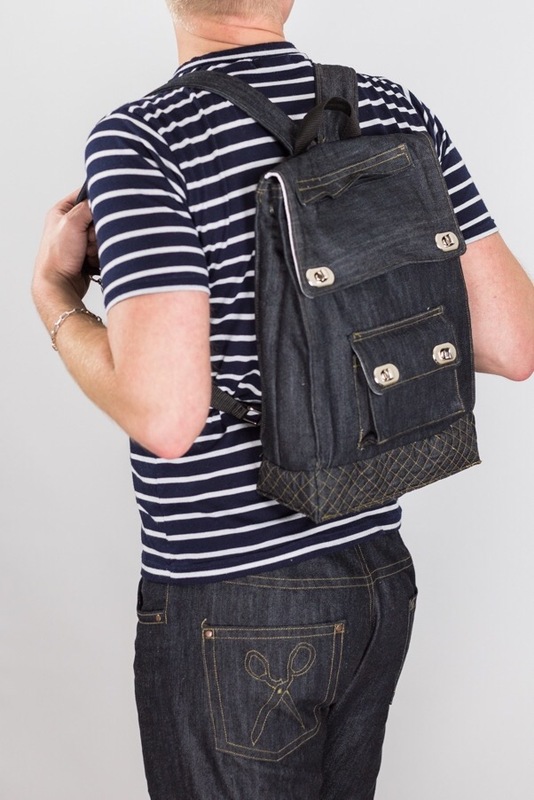 So, if you fancy a bit of stash-busting… why not make a bag?! This whole blog post is a note to self, to be honest! Great work! Isn’t it wonderful to have an all metal vintage machine as a backup to get you through a tough situation like that! 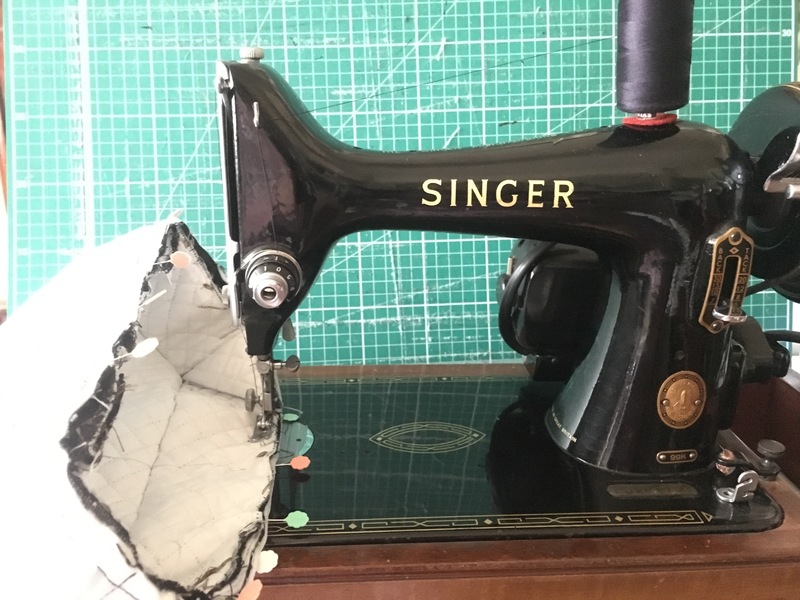 I have five vintage Singer’s and wouldn’t any of them for what they’re making today!! O boy something went wrong. Wanted to say: Great idea to make good use of leftover fabrics. Thank you Wis, it’s my mums old machine, It only comes out every now and again, but its perfect for those chunky seams! This is an amazing design and made to perfection! Such a great individual bag!